I’ve been talking about time and time management with a number of people over the past few days. Namely, they feel bad about their own time management or they feel bad that they don’t want to work as many hours as some business coaches say they need to. In fact, in one case I heard of a business coach who suggested to a small business owner, with 3 small children, that if she wanted her business to work she’d have to be working until at least 2 am every weeknight if she hoped to make a go of it. Not surprisingly this made the woman in question anxious and very upset. I also worked with a client who only wanted to work 3 days a week, but felt really guilty, as if this somehow made her less of a businesswoman. I say you have to create a business that suits you. Why leave the slaving away of the 9-5 to create a monster business that you have to feed, that wears you down and fills you with dread. You get to create your own version of success. And while, of course, there is hard work involved, you get to choose how much you want to earn, how many hours you want to put in and generally build a business that fits around your needs. There are times when I am awake at ridiculous times in the morning to get everything done, but there are also times when I’m prancing around in the daytime at adult ballet classes or having tea with other amazing business women. Of course, we can’t be crazy and expect to earn £100,000 if we only want to work a day a week. At least at the start anyway! So I thought I’d have a look around at what other people recommend around time and work. And here’s some knowledge for you – in the UK we work more hours than anywhere else in Europe and we are also one of the least productive – so all those hours are definitely not turning into pounds. In Alex Pang’s book ‘why you get more done when you work less’ he points to a number of famous people who only worked 4 hours a day, including Charles Darwin, Thomas Jefferson, Alice Monro (who won the Nobel Prize for Literature in 2013) and French mathematician Henri Poincare. They all certainly managed to get a lot done in those hours and didn't need to be burning the midnight oil to be successful. And science has proved it. Studies in the 1950’s showed that scientists who spent 25 hours in the workplace where no more productive than those who spent 5. And those who worked more than 60 hours a week, where the least productive of all! 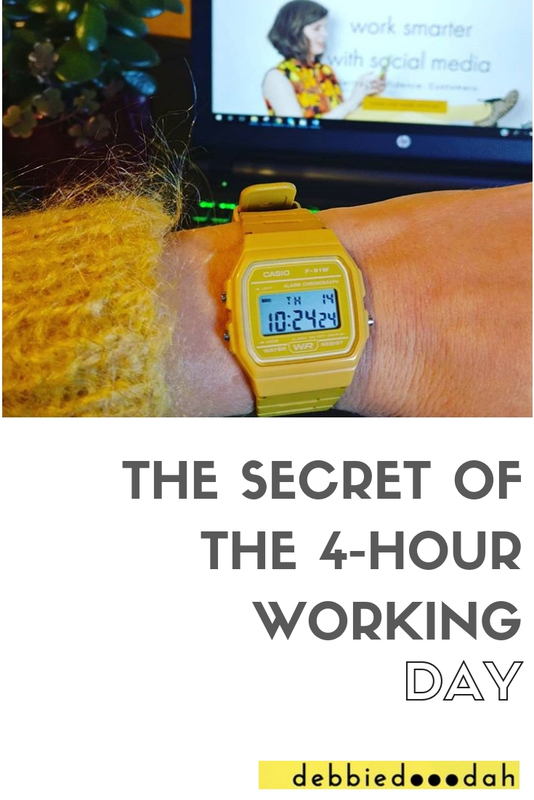 Not quite sure yet about the 4-hour working day? What about 5 hours? A company in America decided to move to a 5-hour workday. All employees worked 8 am to 1 pm and got paid exactly the same. A year later they were the fastest growing company in San Diego, with their 9 person team making $9 million in revenue. So working less made the team more productive, happier (as they got more time to pursue outside interests) and made them very successful. How about a 3-day working week instead? Researchers in Australia looked at working hours for people in their middle ages. They found that anything over 25 hours a week resulted in fatigue and stress. And a recent study in the UK found that 1/3 of workers wasted around 3 hours every day because they weren’t able to concentrate. So the upshot of that is, if you work 25 hours over 3 days, you'll be more productive than working 7 or more hours a day for 5 days a week. Or what about a 4-hour working week! The 4-hour Workweek by Timothy Ferris is a New York Times bestseller and claims to teach people how to escape the 9-5, live anywhere and get rich. That seems a little too farfetched for me, but I’m sure it makes for interesting reading! How can we grab this opportunity? In reality what all of these studies and examples show us is that by concentrating our work into smaller blocks, we are more focused and less prone to distraction. It also means that if we adopt a 4-hour day we’re not going to feel guilty about going to a little adult ballet, a walk around the park, playing with the kids, baking cakes or whatever takes your fancy! We’re going to be able to enjoy our time off a lot more. And we’re going to be able to have more time, which is something most people feel they lack. Obviously, sometimes we’re going to have to work a little more if we have a deadline looming or we’ve got a holiday coming up and need to crack on, but honestly, the extra stress might not be worth it! Next week I’m going to be talking about tools and techniques you can use to manage your time better, so those 4 or 5 hours a day are really focussed, so that you really can create your dream business. So next time you're cramming in your working day into a few hours so you can go and meet that friend, give yourself a pat on the back for being productive, rather than feeling guilty that you should be working! I’m a coach supporting women in business make the most of their online marketing, so they can reach their ideal customers, make more money and build their dream business. There’s no one sized fits all in life, there’s you and your unique business! Thinking of working with me? Why not take a look at what my past clients have to say! Newer PostSave yourself from Procrastination and manage your time! Older PostWhat to do when Business feels like a Roller Coaster!